One of Rudy’s colleagues went back to Kota Kinabalu over Christmas break, and she was very kind to help us get some amazing seafood her hometown is famed for. 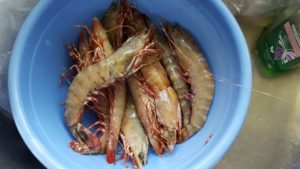 We received 2 kilos of the biggest shrimp I’ve ever seen (10 to 12 a kilogram, aptly described as “extra colossal”), and I really wanted to do them justice and showcase their flavor. This recipe used few ingredients from stuff I already have in my pantry, and did not disappoint, despite me messing it up a little. After finishing the shrimp and soaking up the leftover sauce with our crusty bread, we were all left in a food coma. Thank you so much, Daphne! Based on the recipe from the blog How Sweet It Is. Preheat oven to 220 degrees C (200 degrees C fan). 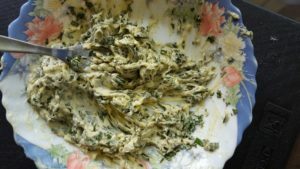 Combine the butter, basil and 1/4 teaspoon salt together in a small bowl, mixing to combine. Place butter on a piece of plastic wrap, shaping it into a ball or a log and wrapping it up. Set in the fridge to harden. 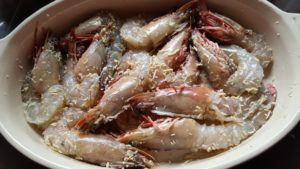 Add shrimp to a large baking dish. Add the remaining teaspoon of salt, black pepper, and olive oil, and toss to coat evenly. Place the dish in the oven and roast, until shrimp turns pink, 5 to 10 minutes (mine took about 8 minutes), and remove from the oven as soon as the shrimp turns color. Slice the basil butter into chunks, and add onto the shrimp. Sprinkle with the parmesan, additional basil and cilantro, then serve immediately with a loaf of crusty bread.